Paris – November 20, 2017 – From June 9 until October 6, 2018, the four seater bike, Alternatiba’s emblem, will go back on the roads of France and its neighboring countries. Promoting alternatives to climate change and resisting “false solution” projects is the programme of this big and popular mobilization organized by Alternatiba, Friends of the Earth France and ANV-COP21. Forty-one partners, from community and voluntary organizations to solidarity economy businesses, have already pledged their support to the Alternatiba Tour. For almost 5 800 kilometers, the Alternatiba Tour will launch from Paris on June 9, 2018 and will reach Bayonne on October 6. Two hundred stops are planned on the way, in France and its neighboring countries. The three and four seater bikes, emblems of the movement’s collective strength, will stop in big cities such as Toulouse, Grenoble or Nantes, but also in rural areas and iconic places of resistance, to finally arrive for the huge Village des alternatives in Bayonne. Resisting at Notre-Dame-des-Landes, protesting against the burying of nuclear waste in Bure, mobilizing against the Midcat pipeline project in Perpignan, celebrating transitioning towns like Ungersheim or the photovoltaic parc in Aubais, fighting against the A45 highway in Lyon : a few examples of the stops on the Alternatiba Tour who will shed a light on how citizens can carry successfully the ecological and social transition. This ambitious project was built to bring the action and the ideas as close as possible to every citizen : each day a lecture on climate change and its solutions will be held by the team of bikers. At each stop, a course on non violent action will be organized, as well as a distribution of guides and tools to help local advocacy for climate change. Furthermore, each local group will welcome the Alternatiba Tour by a velorution (a march by bicycle), and as many gatherings and events as they can plan. This project, organized by Alternatiba, Friends of the Earth France and ANV-COP21, already gathered forty-one partners, from community and voluntary organizations to solidarity economy businesses, who have already pledged their support by signing the “Call to join the Alternatiba Tour”. 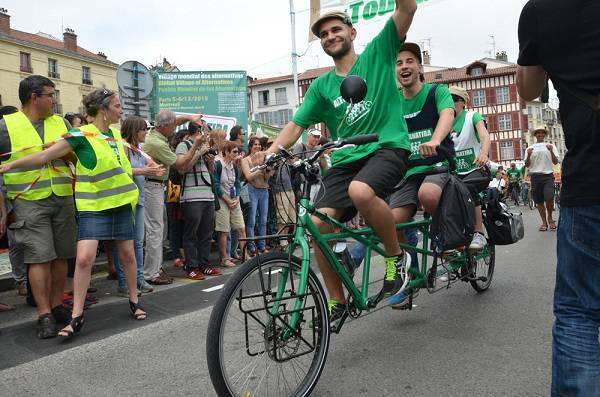 In 2015, the Tour Alternatiba’s first run mobilized more than 60 000 citizens just before the COP21. 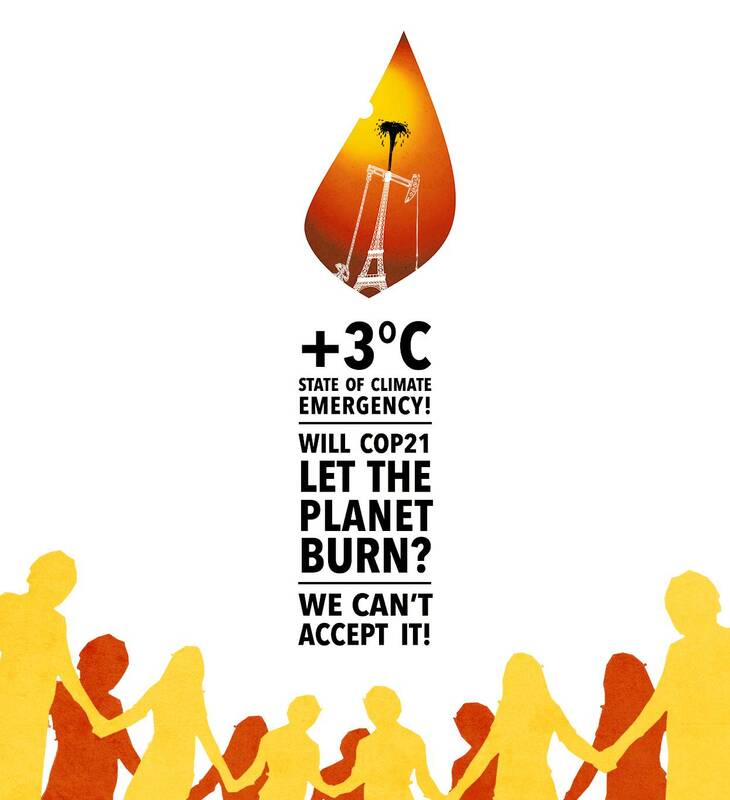 While 2018 could already be seen as a capital year for climate, in particular with the IPCC’s new report coming out, the Alternatiba Tour wants to bring together even more people around this issue by heightening awareness of existing alternatives and creating a new generation of citizens ready to act against climate change. Despite the Paris agreement’s target to keep a global temperature rise below 1.5 or 2 degrees Celsius this century, the sum of national voluntary commitments across the globe actually leads to a rise by 3.5 degrees Celsius, or even up to 6 degrees Celsius! Climate disruption, which is already devastating the lives of millions mainly in countries of the Global South, is about to get even worse and could threaten civilised human life around the world and even the survival of mankind. The pace at which the situation is degrading is such that it no longer concerns just future generations anymore, but also the kids born today. So, what can be done against it? From June 09 to October 06, 2018, the Alternatiba Tour will go on a 5 800-km journey on multi-seat tandem bicycles across 200 territories in France and in the neighbouring countries to spread a message of hope: yes, alternatives do exist, we can live differently, we can live better, and we can hinder climate disruption! Alternatives exist across all our territories, and in all types of fields. The Alternatiba Tour will make a stop in all the territories it crosses, gathering everyone involved in alternatives to put them in the spotlight and bring them to a wider public. Far from proposing false solutions, which are unfair, hazardous and inefficient, such as geoengineering, GMOs, biofuels or nuclear energy, far from the excesses of carbon trading, of useless and imposed large-scale infrastructure projects, of free-trade and investment agreements that only increase the power of global companies, thousands of substantial alternatives to the causes of climate disruption are already being used daily by millions of people, associations and communities. Peasant farming, sustainable consumption, short distribution channels, vegetarian and vegan diets, reshoring, distribution of wealth, work sharing, social and ecological conversion, climate jobs, ethical finance, common goods protection including water, land and forests, sustainable fishing, food sovereignty, solidarity and sharing, repairing and recycling, waste reduction, soft transport modes and sustainable mobility, eco-refurbishment, combatting urban sprawling and land degradation, preserving agricultural land, protecting biodiversity, energy sobriety and efficiency, renewable energies, transition towns and cities, environmental education, and so on – alternatives already exist. They are evolving and crossing paths, they create quality jobs, and they are desperate to gain strength, to grow and to multiply! The Alternatiba Tour will leave on June 09, 2018 from Paris, where the Paris Agreement on climate change was signed. It will arrive on October 06, 2018 in Bayonne, where a great Alternative Village will be held just a few days after the publication of the next IPCC special report. We cannot wait for the solution to come from higher ranks – we should take decisive actions from the base to achieve the successful transformation of our way of life and to change the system. We can bring a tangible change at our own level across our territories all the while exerting more pressure to force changes globally. That’s why we will be there all along the Alternatiba Tour next summer, and why we are ultimately calling on all of you to join us. The fight for climate justice is happening now, and we must act now!